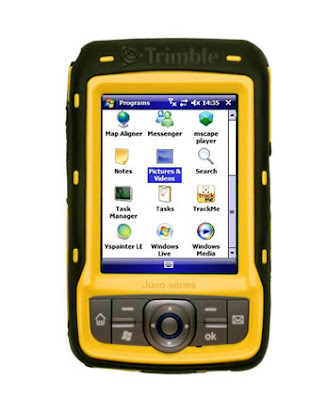 After much deliberation, the Experiential Learning CETL (University of Plymouth) now has a set of Trimble Juno SC PDAs for use in fieldwork. These devices come with built in GPS (2-5 metre accuracy), SIM modem, camera, Wifi and bluetooth ideal for numerous teaching and learning contexts. The picture shows the PDA housed within its own bespoke OtterBox. The box is designed to take the usual knocks an bumps and incorporates a screen protector. It has been quoted on some sites as acceptable for 'light rain' use, although we recommend using AquaPacs to ensure complete protection from the elements. The software we currently deployed on these devices for our own educational contexts include: ArcPad, Memory-map, MScape and TrackMe. These range from purely factual information gathering (e.g. for CVs) to the more subjective student centred reflective journals. Reflective journal information can be used as evidence in, for example, the ‘further information’ sections of job application forms – what the students did, achieved and skills they used in their projects; or perhaps even their labwork/fieldwork experiences. The 5th Annual e-learning conference hosted at Plymouth University is upon us. Proposals are being taken and details are available on the Plymouth e-Learning Conference 2010 website. Only a 200-300 word online abstract required, easy! The online submission form. Steve Wheeler the conference chair has given his thoughts on his blog. Graphic courtesy of Mark Lyndon.